WITH HIS 16th rebound against the Memphis Grizzlies, reigning NBA MVP Russell Westbrook became the first player to average a triple-double in multiple seasons. Westbrook’s memorable rebound came on an air ball from Kobi Simmons in the third quarter of the Oklahoma City Thunder’s game against the Grizzlies. The Thunder star averaged a triple-double last season with 31.6 points, 10.7 rebounds and 10.1 assists per game, but some are sceptical saying that the Thunder have padded his rebound stats this season allowing him to get boards that other players could have easily grabbed. 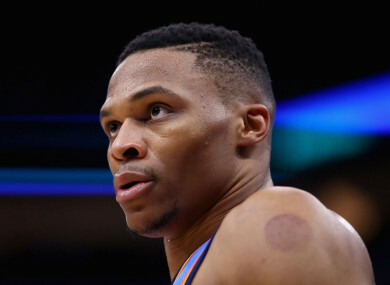 Ahead of Wednesday’s contest, Westbrook was clearly frustrated and tired of hearing others question whether he steals rebounds from his team-mates. “A lot of people make jokes about stat-padding or going to get rebounds,” Westbrook told reporters. ”If people could get 20 rebounds every night, they would. If people could get 15 rebounds, they would. The people that’s talking or saying what they need to say, they should try doing it and seeing how hard it is, since everybody wants to be talking. Email “Westbrook becomes first NBA player to average triple-double in back-to-back seasons”. Feedback on “Westbrook becomes first NBA player to average triple-double in back-to-back seasons”.